Christmas tree growers wait to load up trees for soldiers. 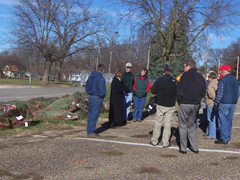 Iowa Christmas tree growers brought donations of their crop to the Iowa State Fairgrounds today for the annual “Trees for Troops” operation. Iowa Christmas Tree Growers Association executive director, Jan Pacovsky, says 27 growers donated over 125 trees that’ll be sent to soldiers. Pacovsky says this is a volunteer effort and growers can donate as many trees as they want. One grower donated 23 trees this year. She says the FedEx company donates the shipping for the trees. Pacovsky says the growers also donate money to help trim the trees. She says they’ve collected over $300 that goes to the national association and they buy decorations for the trees. Pacovsky runs Pine Acres farm in New Hampton with her husband Mel. She says it’s the fifth year for the program and they always get letters of thanks. Pacovsky says they get letters from family members of those serving in Iraq and other countries who say they are limited in their time together as a family and the trees mean a lot to their children. Pacovsky says the growers also benefit from knowing they are helping servicemembers. She says it means a lot to know they are doing something good for the people who are giving their time to make us safe. Steven Hoogestraat runs a tree farm in near Carrol, and donated 23 trees. “I am very privileged to have a product that is…wanted, that I can contribute to the well being of our servicemen,” Hoogenstraat says. Hoogenstraat is a Vietnam veteran and says he understands how important it is to have a piece of home during Christmas overseas. Iowa Christmas trees wrapped and ready for shipment. He says it is their way of telling the men and women in the service that “we do appreciate the, they are thought of, and we are very proud of what they are doing.” Hoogenstraat says the upcoming holiday is probably the toughest on the troops overseas. “When you’re over there, you can make it through most of the holidays fairly easy, Valentine’s Day, Easter, anniversaries, birthdays, but when Christmas comes, it is really tough. Yes it is. Christmas is a tough one to get through,” Hoogenstraat says. 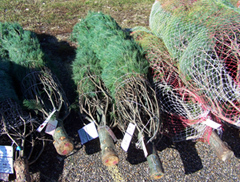 The “Trees for Troops” program is expected to collect and deliver between 17,000 and 20,000 trees nationwide. Lee & Lynne Aldrich, Aldrich Tree Farm, Belmond; Ken & Shirley Andrews, Wickiup Tree Farm, Alburnett; Marvin & Janet Bassett, Harmony Christmas Tree Farm , Stuart; Neal & Marie Bork, Country Pines, Marcus; Andrew & Diane Davis, Scotch Hill Christmas Trees, Oskaloosa; Jerald & Cindy Deal, Deal’s Orchard. Jefferson; Jim & Gladys Dixon, Dixon Tree Farm, Norwalk; Dale & Julie Fagner, DJ Christmas Pines, Elkader; Mark & Jackie Fisher, Fisher Tree Farm, Clear Lake; Gary & Jane Harman, Walnut Ridge Farm, Indianola; Harold & Carol Hill, Hill’s Tree Farm, Minburn; Chris & Wade Hinders, Hinders Trees, Woden; Steven Hoogestraat, Hoogestraat Christmas Tree Farm, Arcadia; Sandra Hunter, The Christmas Tree Farm, Maxwell; Mike & Renee Kidman, Kidman Tree Farm, Polk City; Mark & Twylah Kragel, Kragel Christmas Trees & Traditions, Clear Lake; Loren & Liz Kruse, Kruse Christmas Farm, Grundy Center; Terry & Lona Lewis, Horse Creek Farm, Sidney; Bob & Karla Moulds, Wapsie Pines Tree Farm, Fairbanks; Rick & Joyce Larson, Brushy Creek Farm, Decatur City; Jim & Marilyn Murphy, Murphy’s Walnut Hill Nursery, Runnells; Vernon & Sarah Rettig, Rettig Tree Farm, Bondurant; Joe & Janice Reutter, Enchanted Valley Tree Farm, Boone; Anita Shockley, Clearview Tree Farm, Bloomfield; Bob & Terry Strohbehn, Poweshiek Pines Tree Farm, Brooklyn; Jerry & Kelle VanVacter, Riverside Trees, Duncombe; Larry Ward & Jodie Bassett, Harmony Tree Farm North, Stuart; Michael & Deb White, White Christmas Tree Farm, Indianola.